Purpose built software, systems, servers, cloud infrastructure tightly integrated with technical and creative services for harnessing the global digital information economy. Interactive: Touch Section for details. Digital Deli Advanced Technology Integration (ATI) is a configuration management program that tests and certifies hardware, firmware, software for integration into the Digital Deli Pipeline to ensure reliable, high performance, secure system architecture. ICTS1 Configuration Management controls allow new spokes to be inserted, tested and released in a robust manner that is reliable, predictable and always cutting edge. Digital Deli DevOps | Trusted Systems designs and develops custom software solutions for servers (inc. database, web, mail, firewall, cryptographic ciphers), client applications, firmware and embedded systems. Digital Deli DevOps team of technologists weave threads from cutting edge open and closed source repositories into beautiful custom tapestries that connect to the Digital Deli's world class pure digital pipeline. We start with Trusted Systems and security protocols at each layer that are optimized for performance, reliability and interoperability. Think of the Digital Deli Gen-3 Cloud™ as a power plant where your vision is transmitted for consumption securely to any device. Just add content, mix and you are ready to go. A pure silicon solution with no moving parts on a 40Gbps backbone with IPv4 & IPv6. High level TLS, always on encryption and authentication @ Gen–3 Cloud™. A core technology integrated into the Digital Deli's world class pure digital pipeline. iShop | E-Commerce Core™ from the Digital Deli provides global e-commerce seamlessly embedded inside of custom web designs. We packaged everything needed in one place to make it simple. A beautiful combination of the most advanced web development framework with practically no design limits and robust secure e-commerce wrapped inside. A digital on ramp especially well suited to businesses needing to convey the unique attributes of their product. Digital Deli Pipeline services may be inserted into system configurations to meet baseline PCI (financial) and GDPR (General Data Protection Regulation) level compliance for robust global system deployments. Enjoy the recurring benefit of precision organic SEO (search engine optimization) for optimum market visibility and sales opportunities. Gen-3 Elastic Cloud service allows specialized boutiques to start small and scale to meet demand without replacing expensive software or servers. Managed DNS, zone records, authenticated domain certificates, cipher suite integration, ultra class business email and a robust admin dashboard provides a turnkey solution for harnessing the digital economy, for any size business. Strict Transport Layer Security (TLS+) protects your customer, while commerce sites are individually protected and authenticated with safe site greenbar trusted certificates for each domain. When A+ Server Security is not enough to neutralize a threat vector Digital Deli RED Cyber Intelligence operation can provide specialized services to restore order. Custom dashboard permits selling any type of physical or digital product or service. Seamless Inter-Cloud financial transaction processing allows focus to remain on selling - not becoming a computer whiz. Gen-3 Cloud™ serves your products using the worlds fastest web server technology with 40Gbps Internet connectivity on IPV4 and IPV6. Advanced analytics refine audience targeting and guide digital strategy with a high degree of accuracy and at the least cost. Welcome to the future of seamless turnkey global e-commerce. Digital Deli WebDev | Reactive Internet Multimedia is a framework used to seamlessly render nearly any type of media (content), at any commercially available resolution, for nearly any type of Internet connected device. You might think of this as a Rendering Engine for the Internet. Thousands of enterprise class libraries sit under the surface in a robust, trusted computing framework. The Reactive Internet Multimedia system is used to create development environments, that developers use to make designs that are populated by content creators for highly customized, lightning fast digital portals, for any type of purpose. One code base packages precisely formatted mobile-to-4K multimedia content that renders perfect on every device: mobile, tablet, desktop, HD1080P, 4K ultraHD. Development builds execute in real time, while Production builds are compiled, linked and compressed from source code for optimum performance in server driven and embedded applications. ICTS1 Configuration Management ensures the largest sites to the smallest digital portals enjoy the same tight integration and high level of security. Cryptographic libraries and cipher suites interact with Gen-3 Cloud servers for baseline PCI (financial), HIPAA (healthcare) and GDPR (General Data Protection Regulation) level compliance. Gen-3 Cloud™ and Digital Deli Studios™ understand each build so digital services (server, media) may be provisioned within a robust operations and support framework for long term reliability. TLS+ | Always-On Encryption means that the systems deployed under control of the Digital Deli employ strict "Transport Layer Security" to protect client systems and their customers. There are a lot of "moving parts" associated with making this work. When you receive your boarding pass for your new domain or Internet Resource it is all setup and ready to use. There are no certificates to buy, cipher suites to configure or special server adjustments to complete. Inter-cloud communications from your server to credit card processing is seamless and transparent. The "strict" part ensures that the entire pathway through the Internet for customer to financial partner only travels across secure connections. Insecure connection pathways are immediately detected (ie: secure 4G -> insecure WiFi) and stopped cold without any user intervention. Advanced system configurations could fill a book, but they are all centrally managed internally by Digital Deli Network Operations Control (NOC). Cryptographic Ciphers • Transport Layer Security • Server OS Patch Management • Intrusion Detection • Vulnerability Testing • Authenticated Certificate Management • Custom Firewall Management • Domain Key Management • Rootkit & Malware Detection • Inline Virus Scanning • DNS Tunnel Scanning • DMARC MTA Configuration • Daily Threat Mitigation. Cyber AI is managed by Digital Deli RED | Cyber Intelligence as a part of our Managed Secure Server Provider (MSSP) service offered through Digital Deli Biz | Digital Economy ∴ B4B. 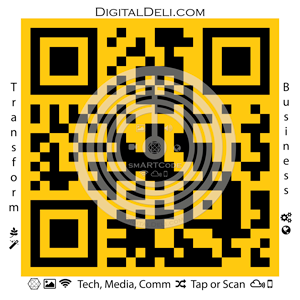 Digital Deli iAuth+™ | Domain Certified Email is business+ class email service. The Digital Deli is a MTA (mail transport agent) that interacts with other MTA's over the Internet. When "onboarding" email for client domains our deployments include: DMARC, SPF and DKIM to protect business reputation and help eliminate spam. A DMARC policy allows a sender to indicate that their messages are protected by SPF and/or DKIM, and tells a receiver what to do if neither of those authentication methods passes – such as junk or reject the message. DMARC removes guesswork from the receiver’s handling of these failed messages, limiting or eliminating the users’s exposure to potentially fraudulent & harmful messages. DMARC also provides a way for the email receiver to report back to the sender about messages that pass and/or fail DMARC evaluation. DKIM (Domain Keys Identified Mail) is a method to validate the authenticity of email messages. When each email is sent, it is signed using a private key and then validated on the receiving mail server (or ISP) using a public key that is in DNS. This process verifies that the message was not altered during transit. Sender Policy Framework (SPF) is an open standard specifying a technical method to prevent sender address forgery. Today, nearly all abusive e-mail messages carry fake sender addresses. When MTA's have a problem or network operators cautiously block network paths the Digital Deli Network Operations Control (NOC) will intervene to clear remote Internet pathways on behalf of legitimate client requests. iAuth+™ | Domain Certified Email employs many other advanced features for business+ class domain email. The service is not sold separately by itself and is only available as an option with web ecosystems hosted on Gen-3 Cloud™. Digital Deli iRepX™ | Information Analytics goes beyond SEO, Analytics and Reputation Management to encompass a full range of capabilities that may be harnessed for enhancing brand perception, elevating search results organically, audience attraction and deep web analytics. The web can be like the wild west at times. Whether a 500lb. gorilla just landed on your chest or you need a highly optimized launch vector plotted – the Digital Deli iRepX™ service has a powerful suite of services to turn data into actionable results that matter. Because the Digital Deli controls it's own infrastructure (cloud, servers, domains, network) and has a trusted relationship with our technology partners we can provide unprecedented levels of service rarely available from a single vendor. Our job is always your success. Digital Deli iNet On Ramp | Internet Boarding Pass is a systematic method for bringing production systems online with control and precision. Our Configuration management from the Registrar TLD (top level domain) DNS to our NS servers, Zone Records, domain, email and database servers (pre-provisioned, pre-tested and certified) allows new systems to replace old production systems in minutes. Good planning and tight coordination means everything works in a reliable and predictable manner without any costly delay. Digital Deli IoT • M2M • I40 • AI | Configuration Management services provide the logic engineering blueprint for firmware, systems, software, security, processes, methods and algorithms vertically integrated for use across a wide range of industries and disciplines including: education • entertainment • health and wellness • energy • smART cities • geofenced sensor networks • location based services (LBS) • digital commerce • new forms of advertising, marketing and promotion. Digital Deli Archive™ is a managed repository of high quality image, video, audio and geospatial assets hand crafted by experienced masters of light & sound trained in the art and craft. The creators of the Archive are pioneers in raw image sensor processing for professional digital imaging (well before Lightroom came along). A calibrated media lab permits a full array of high quality media production for digital displays [mobile-4KTV] and professional photographic printing. Digital Deli Fine Art Store™: create stunning visual and spatial themes for your home, business and public spaces. One of the largest selection of Display Solutions on the web to compliment any decor or personal taste. Mixed Media Lab: calibrated media lab for producing high quality image, video, audio and geospatial media assets for mobile, tablet, desktop, 4KTV and professional printing. Multi-track audio and video editing, mixing, mastering and transcoding are lab services. Rare, Unique and Authentic: the records in the Archive span a century, oral histories, folklore, customs and ways of life have been captured across historically rich and pristine areas of the eastern United States and Canadian Eastern Maritime – with a special focus on New York State, New England, Nova Scotia, New Brunswick, Bay of Fundy, Cape Breton, Appalachia, the Adirondack, Blue Ridge and Smokey Mountain regions. Iconic imagery of legendary performers, people, world class events and festivals are all a part of the Digital Deli Archive. Exact prescriptions for size, surface substrate and finish are used to produce technologically superior finished media. Digital negatives pressed from raw image capture data are produced to exact specifications to provide breathtaking vibrance, clarity, detail and a rich color gamut for unmatched quality. Micro Edu–tainment Multimedia from the Digital Deli Archive™ is designed to be educational, while entertaining, during the course of conveying knowledge on a subject, in short bite size engagements. Cognitive neuroscience has taught us we can convey more memorable information in a shorter time frame by precisely orchestrating the message. Advances in audio-visual media programming, communications and technology permit extended learning program development using a suite of complementary services available under one roof from the Digital Deli Pipeline™. Digital Deli Studios™ provides multimedia design, development and production management for: Advertising • Marketing • Promotion • Public Awareness • Instructional • Educational • Interpretive • Visual Storytelling. We are inspired by many non-profits rushing to fill the gaps in our world and stand ready to help. We cheer our bold entrepreneurs wishing to change the world and carve new pathways. We applaud organizations reinventing themselves for a more sustainable 21st century future. Media rich accelerated learning programs can support advancement and stimulate life long learning. Our children represent a future we must nurture in the digital age with factual and relevant information. Cognitive neuroscience tells us young minds are capable of absorbing much more than we are giving. That is why we created a powerful digital on ramp called smART Media for the Classroom™ and the Digital Deli Geospatial Team One (GT1) Student Explorer Program. It worked well out of the lab during trials to gain a brief burst of notable international attention. A powerful Swiss Army Knife for any passionate educators toolbox. smART Media for the Classroom™ | Media for Your Mind is the natural extension to micro edu-tainment multimedia. Once you have captured interest, a wide variety of knowledge resources may be custom curated including, but not limited to: geospatial data, expert knowledge sources across disciplines, deep subject matter experts, critical factor awareness using STEAM; practical applications of scientific advancement; cross discipline correlation [understanding the big picture]; future trends [what really matters]. smART Health Media™ relies on similar attributes for conveying knowledge in an always-on digital world, but exclusively for healthcare. Marketing, Advertising and Promotional Multimedia obtains benefit using the laser targeting edu-tainment multimedia model. A great value for those wishing to craft a memorable and pleasing impression in concert with a sound digital strategy. Geospatial Archeology: From the tip of Nova Scotia to the Great Smokey Mountains to the Statue of Liberty a series of 59 epic stories distilling the essence of the American and Canadian experience are in queue at the Digital Deli Studios™: Stories Across America, Stories Across Canada, Unique Patterns of Nature and Tales from the Master Storytellers ™ . Do you have a great story that needs to be told? Do you wish to sponsor a micro edu-tainment multimedia production? Please direct your inquiries to: Studios [at] DigitalDeli.us or by leaving a message on the Digital Deli Archive Contact Page . Digital Deli TV™ publishes IP based, multimedia using Reactive Internet Multimedia technology on a global enterprise class network. You might think of Digital Deli TV as an ultra-modern theatre built for the Internet. UltraHD media from Digital Deli Studios™ is so crystal clear it is like looking out a glass window. You can almost feel the cool spray from a waterfall. Network quality of service, media encoding, transcoding, codec configuration and all the things the Internet needs are centralized in one place for perfect playback on any modern device. The future is always just around the corner. With a keen eye always on the innovative research at NHK Science & Technology Research Laboratories and the MIT Media Lab we can see a clear view of future technologies and design for that now. The rendering algorithms used in Reactive Internet Multimedia have been 16K ready since 2011. 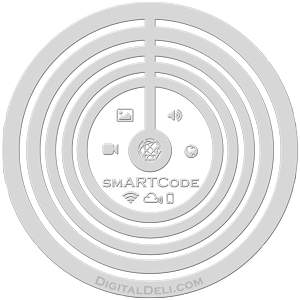 Digital Deli smARTCode technology used in Live Labels ∴ M2M can trigger multi-mode communications today. As screen densities and Internet speed continues to increase our pure digital pipeline is purpose built looking 20-30 years into the future. Digital Deli Private Net™ and Digital Deli Secure Net™ are commercial business media content delivery and rendering services providing seamless scheduled and on demand delivery of any media content for networked digital displays and on private networks. Regional Content and Edu-tainment Networks are hybrid video streaming services for live host driven and scheduled broadcast for educational and regional content channels. Available Q4-2019. Digital Deli TV One™ ĐĐTV1 OTT-nSTB (over the top network settop box) allows any organization to have their own TV channel running up to 4K 60fps video 24/7-365 - even during a network outage. Digital Deli Cyber Intelligence (ĐĐ RED) is preparing the new high security OS with Digital Deli Think Tank. Available Q4-2019. Media Licensing & Asset Management provides administrative oversight for all works (the Art) in the Digital Deli Archive™ mixed media repository. Extensive metadata, including copyright, releases, royalty agreements, usage restrictions and other special agreements are embedded into each asset (created work, multimedia production, transmedia project, published and unpublished works). Digital Deli Archive™ is a trusted global media repository with full legal authority to Publish and/or License media in compliance with international copyright, U.S. Intellectual Property Law and rules and regulations of the State of New York, USA. Digital Deli's B-Corp Philosophy may include special support for a: cause, place, event, geospatial location, cultural artifact or digital preservation effort – that may be associated with one or more media assets. Digital Deli Partner Programs: Eco-Cultural Heritage, Geo-Tourism, Digital Preservation and Community Enrichment may include special provisions that provide direct economic benefit to partner organizations. Broadcast and Public Performance licenses for Micro Edu-tainment Multimedia from the National Treasure Series, smART Media for the Classroom™, smART Health Media™, multimedia documentaries and transmedia digital portal projects are managed under the same administrative wing. On demand and Subscription services are governed by end user agreements administered by Digital Deli Media Management. Content Curator service provides Agency Access Partners rights ready and commercial cleared media (image, video, audio, geospatial), media lab direct production services at Studios, CDN delivery at Gen-3 Cloud and media rights consolidation. Fully integrated turnkey digital service agreements typically bundle software, firmware, media, technology and communications to simplify bringing new customer projects online with the least cost, highest quality and no surprises. Digital Deli, as Publisher, straddles two worlds equally: Content Creators (artists, copyright holders) and users of Licensed Media are treated fairly and with respect for each parties individual interests. Creators are compensated fairly while rights ready and commercial cleared media Licenses clearly spell out usage without complexity to ensure legal compliance. An equal balance with no surprises. Questions associated with Licensing rights ready / commercial cleared media or by Content Creators may be directed to: MediaManagement [at] DigitalDeli.us or by leaving a message on the Digital Deli Archive Contact Page . Intellectual Property Management (IPM): The Digital Deli Family [domains, properties and brands] manages a diverse collection of intellectual property (IP) assets including but not limited to trade secrets, copyrights, business processes, methods and techniques used to design, develop and deploy innovative digital services for existing and emerging markets. Our Company takes extraordinary steps [legal agreements, authorized access, employee & contractor education] to protect our IP. We apply an equal standard protecting the IP Rights and Confidentiality of our Partners, Clients and Customers. Our standard policy is to protect the privacy and confidentiality of all business. Clients who "use" Digital Deli IP typically pay a monthly or annual fee for the "rights" to use the IP (ie: software, systems, firmware) for the legitimate business purposes of "Client." All IP rights are reserved by Digital Deli and no ownership is conveyed. RFQ's and Confidentiality Agreements: to save time and money it is our suggestion that any NDA (nondisclosure agreement) submitted for Client engagement (RFQ) be binding equally (NDA) on both parties. That way IP under development (inc. business methods, processes, trade secrets, etc) by either party may be disclosed to accelerate your project. Business integrity, trust and fairness is at the heart of our B-Corp Philosophy. Digital Deli Business Innovation ∴ Think Tank™ (BITT) is the place where the logic of multiple disciplines are fused into firmware, systems, software, security, processes, methods and algorithms to put the human touch on advanced technology integration to harness the global digital information economy. We turn concepts into products and services using the pillars of science, technology, engineering, arts and math (STEAM). The Digital Deli Pipeline™ was conceived and built by the Digital Deli Business Innovation ∴ Think Tank (BITT)™ to provide seamless ICTS1 digital services vertically integrated for use across a wide range of industries and disciplines including: education • entertainment • health and wellness • energy • smART cities • geofenced sensor networks • location based services (LBS) • digital commerce • new forms of advertising, marketing and promotion. Our Mission: design, develop and deploy technology solutions that will invigorate and breath new life into an ever growing and increasingly complex world filled with challenges. We hope our contributions will be just as important to advancing our world now as they will in 100, 200 or 300 years. Partners: With strategic partners, clients and like minded organizations we push the envelope of what is possible with a keen eye on the future. We look forward to working with partner's like you to accelerate that advancement.